I got some "white blood " from a cactus in my mouth , and now my lips , tongue , and throat are burning. Not bad , but its not going away. Am I going to die ? Are you sure it was a cactus and not this plant? This is an African milk tree and often confused for a cactus, but it's white sap isn't harmful but is an irritant. Cacti don't have a white sap. Maybe the emergency room or your private doctor should be seen to be on the safe side. Every time I see myself bleeding, or someone else, I always taste blood in my mouth, but there is never any blood there if I try to spit it out. Why does that happen? 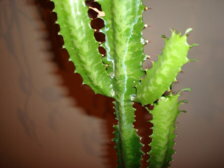 Tell me about Cactus plant may v planted cactus in home ? And what Islam say about cactus plant ?